Organic- its the new it word of the 21st century and probably the most discussed in the last decade (and the next) when it comes down food, or anything related. What it is really? Wikipedia states organic foods "are foods that are produced using methods that do not involve modern synthetic inputs such as pesticides and chemical fertilizers, do not contain genetically modified organisms, and are not processed using irradiation, industrial solvents, or chemical food additives"
Potted gardens are the easiest way to introduce fresh "organic" food into you life. Start with this then work your way out to a raised bed. Last year I went full out with the garden and I wasted a lot of squash. This year I decided to go smaller, 1 plant of each. I planted eggplant, cucumber, peppers, strawberries, zucchini, squash, tomatoes, and artichokes! I very interest to see how this will come out, because 4 of these are really huge vines, but if they spill out onto the deck it won't be that bad. I was going through my pictures this morning see what I would like to write about today and she just ever so gently came up to me. No noise, no craziness (like usual) and stopped right in front of my face. It's almost like she's saying "I Love You Mommy..." "please dont go to work today" I wish I didnt have to :( but then I wouldn't be able to take all these pretty pictures of my house because I wouldn't be able to decorate it! So, here are the pictures of the progress of our latest project, the Crown. I really don't have much to say about this except I am kind of unmotivated... 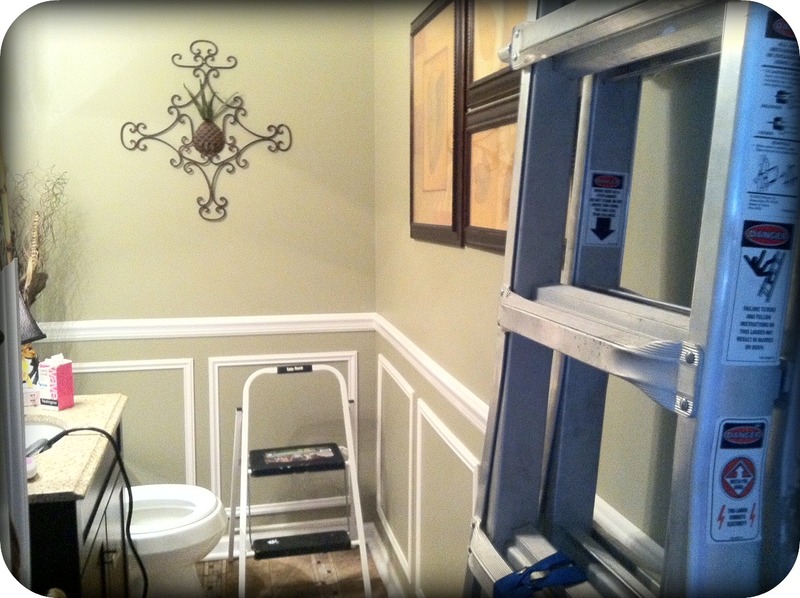 Hence the hugh ladder and stepper still in the bathroom. I know myself I am an organization (neat) freak, so by leaving them in there it drives me nuts. To the point that I will obsess over getting it done! However, I don't feel like projects should EVER come to that point. They should be and enjoyable learning experience, I just think of it as "taking my time". This is rough, wayyyy rough. The walls in this room are so bad its crazy. I would highly recommend starting in a room that has an outside wall. Once there is caulk and wood filler it should look as good as new! I am really excited to get this taken care of its really hard and I feel like I accomplished something! I swear installing crown moulding is the hardest thing (whaaaa!) I've had to take on in this house (OK) maybe not the HARDEST thing, but I literally sat there starring at the wood and the saw for an hour. Once hubby came home we tried to tackle it together. I watched EVERY online tutorial I could find, and picture I could find. Its still just as hard. The moulding has to be placed on the saw upside down, SOOO when your trying to picture the angle it has to be on the wall you have to flip it, I KNOW! It's crazy right. I found a couple of sites that showed you how to do it with video's and pictures. Click here for a nice tutorial, even though I didn't use foam moulding, or here for inside corner and here for outside corner. The inside and outside corner videos are from Superior Building Supplies' Blog. They really help out and explain it well. Also, you have to keep in mind that the walls are not straight. I.e the straightest walls in a house or the outside walls, or the walls that make up the outside structure. inside walls are NEVER square. We started this project with a box in the middle of our house, so none of the walls are outside walls. We are having a terrible time getting them to line up and look even. It is so bad I don't even want to post pictures. I will so I have record of my pain. Just Kidding, our house has 2 and a half baths, which I believe is the perfect amount to have. Not to many, not to little and not overwhelmingly hard to keep clean. The half bath is for guests (mostly). This is the bathroom that gets all the fancy soaps and sprays. 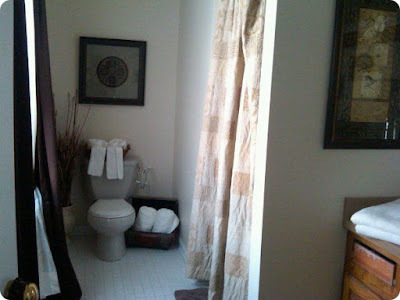 Our bathroom, (the Master) is my haven. It's where I get ready for everything. Going to work or going to sleep, this is usually the last place I visit. I wanted it to be luxurious yet usable. They only downside to this bath is there is no tub :(. Last, we come to our second bath, the "stepchild" The receiver of all things decor that have no other place to go (except the basement). Pink toilet, pink tub and tile. I swear the people in the late 80's early 90's were color blind. PINK TOILET!!! I cant believe they were actually produced. WHO does that. Anyway, it HAS to go and quick! The other night, the hubby and I went over to Home Depot to get the wheels moving and get me inspired for some manual labor. By manual I mean ripping out the old and installing the new. Cherry wood, black granite, classic lines and an inspirational shape. I love different shapes. Because I do "mini" makeovers the pink tub is staying. Well mauve (ugly). I'm sure it will look fine whens its all said and done. This renovation is going to be the floor tile, toilet, vanity, light, and mirror. 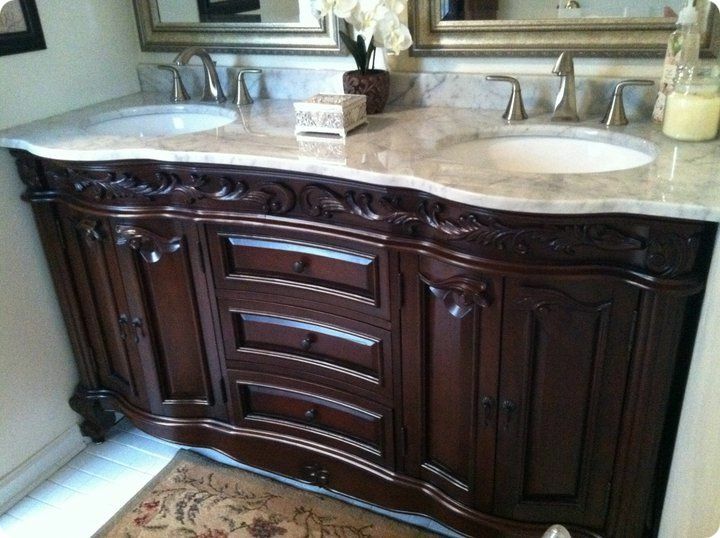 Because the vanity is cherry it already has some of the red/oink tones naturally in the wood. 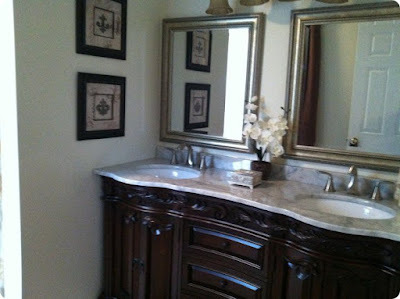 SO I am hoping the vanity offsets the tub. This whole "mini" should cost around $1000 when completely finished. Again, my half bath becomes my guinea pig. 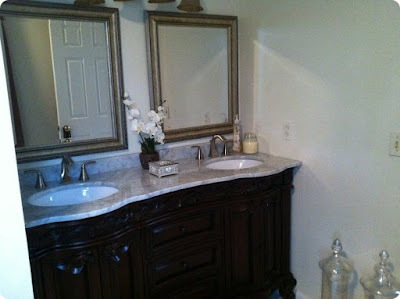 I have posted a picture in my inspirations page of a cute little half bath I discovered searching online. I love the clean lines and the crisp white. 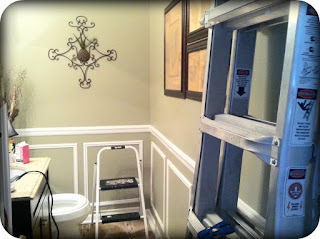 Now that I have mastered the infamous squares that I have been after since I moved in 2 years ago, I have decided to take the daring leap into crown moulding, dun dun dun.... And I would like to add the tile on top of the chair rail with the smaller moulding on top of it. So... After two months of waiting for this to be done. AND.. brushing my teeth in "other" parts of the house I finally have running water in the master bathroom. It took awhile but it was WELL worth the wait. I am so extatic about how it turned out I can hardly contain myself. 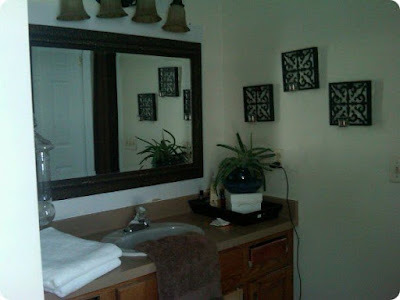 The mirrors are from Kirklands as well as the art on the left wall and the orchid in the middle. The light is going to be changed as well, but I need hubby's help and he is really busy right now. As soo as thats done this will be the best looking room in my whole house! Everyone's doing it and so am I. AND I love this one too!! Visit Alyssa's profile on Pinterest. Click image to get E-Book! Featured in Fall Tablescape Slideshow!